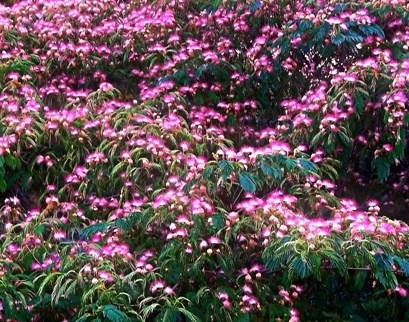 An attractive and fast growing small tree, Albizia julibrissin is native to Iran to Japan. It is a fast-growing plant whose seedlings can become invasive under certain conditions. It tolerates poor soils, as it is a legume that makes it's own nitrogen compounds (with the assistance of nitrogen fixing bacteria). It can be seen growing in the wild in the southeastern U.S. and California, where it is a problem in waste places, fields, and along roads. Its luxurient, ferny leaves and fluffy pink flowers make it an attractive plant, as does the fragrance emitted from the flowers, which attract bees. Seed pods that resemble flat, woody beans (legumes) can persist into winter. Still, care should be used so that seeds from garden plants can't escape into the wild. These are very attractive and priced to sell. Check them out!